you want to open or close through voice. 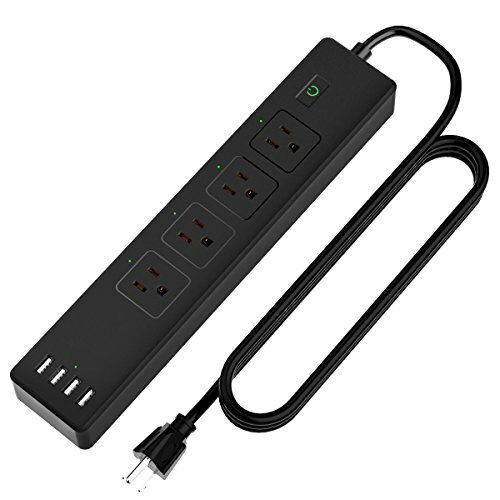 Example "Alexa, turn on the desk lamp~"
【Compatible With Alexa/Google Assistant】The Smart Power Strip can Be Voice Controlled by Amazon Alexa and Google Assistant, Easily Control For Each AC Outlet and Communicate with Each Plug by Name, Smart Your Life. 【Timing & Remote Control】Customized Schedule Can be Created to Automatically Turn Devices ON or OFF as Needed, Like Setting Lights to Come on at Dusk, no Matter Where You Are, You Can Control the Power Strip Via Smart Life App. 【15A Resettable Circuit Breaker】15-Amp Circuit Breaker Trips on Condition of an Overload or a Short Circuit to Prevent Wires From Overheating and Catching on Fire. 94V-0 Fireproof Protection, Giving You Maximum Protection. 【USB Smart ID Technology】USB Smart ID Technology Automatically Recognizes Different Charging Devices to Provide The Best Charging Speed, Maximizing Time and Energy Savings. 【Security & Warranty】Only Support 2.4GHz Wi-Fi network, Not Suitable for 5G Wi-Fi Presently. Do not exceed the maximum current of 10A per AC outlet and maximum power of 1650W in total. View More In Power Strips & Surge Protectors. If you have any questions about this product by Herhea, contact us by completing and submitting the form below. If you are looking for a specif part number, please include it with your message.